The September mornings came and went so fast. Seems like it was only June a few days ago. The tides were right for a morning journey on the Kayak this past week so I have been paddling in the morning and sitting on the dock watching the sunsets in the evenings. Been an interesting week. Late one night near sunset I saw the mating pair of Eagles fly over. I think a feather was missing in the same place on the left wing that I saw missing last year on one of the Eagles. Probably it is the same bird. I have been watching for them. And I get the feeling something has been watching me too. Last week I did get back to the Secret Broward Bird Hangout to see the Spoonbills again. And like before, after a while they get nervous and take off across the river to the old dead tree so again I follow them. I paddle over to the tree and look up. Instead of leaving, they just look down and watch me. One turns its head in response to my whisper. I paddle closer to the tree. It follows me out to the edge of the limb and stares down at me. For a minute there I thought it was going to turn around and drop a “present” but it didn’t. Fortunately for me it is just curious. They just sit there and watch me while I push the doohickey. I also made a return visit to the pelican dock hangout. Larry, Curly, and Moe were there with three more friends (Lizabeth, Shirley and Flo?). I think Larry left first again too. Sad to report a few days latter Tommy the crab trapper said he saw one of the White Pelicans “floating” and now only five remain. The night herons have been active also. Well sort of. 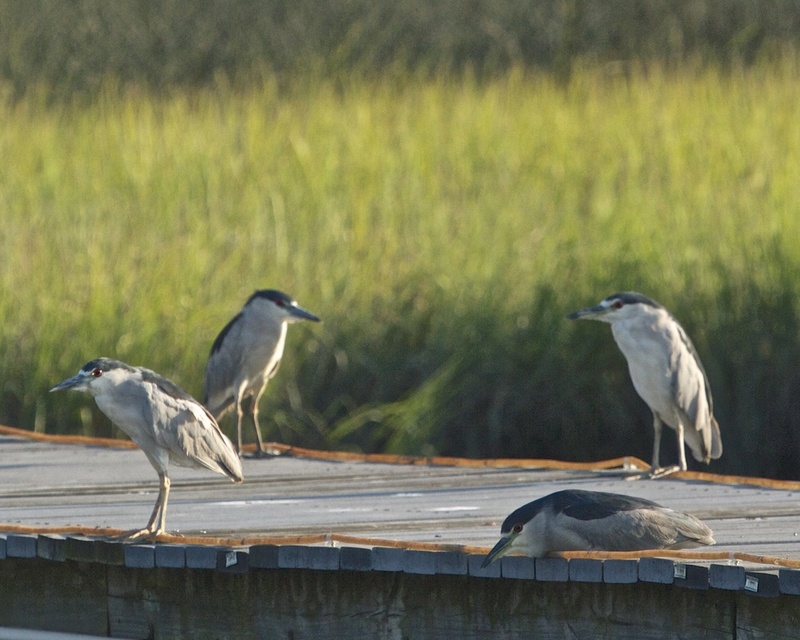 One evening I saw six adult Black Crowned Night Herons resting on the neighbors dock. They didn’t get “active” until I showed up with the camera. The Belted Kingfishers (Spunky and Funky) have also returned to the area and are making themselves known by their familiar shrill squawk. The Eagles have indeed returned to the Broward. I think he is following us! Look there he is again with that stupid camera! If you don't leave I might do something nasty! If he comes any closer I'm gonna poop on him! Go ahead and leave, or I'm telling on you! Larry, Curly, and Moe with Lizabeth, Shirley and Flo? It's been a hard days night for the Night Herons. 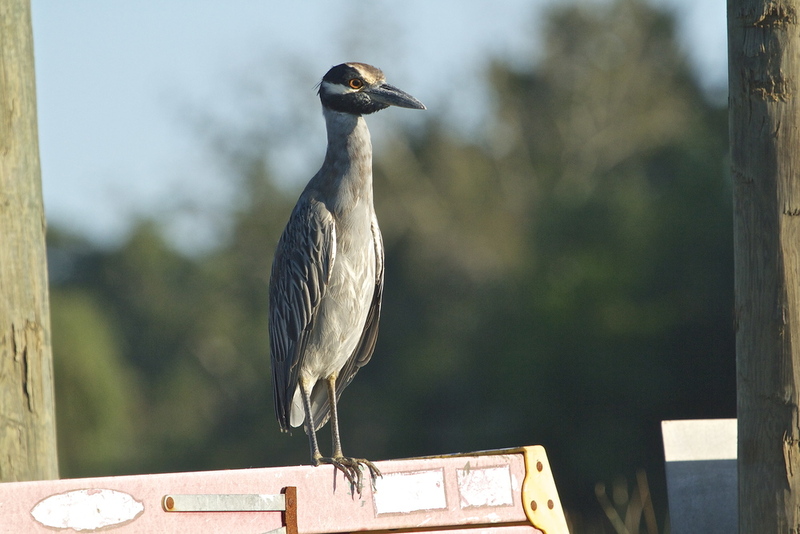 George, the Yellow Crowned Night Heron has been gathering dirt on someone, and it is all over his legs. The Kingfisher is perturbed about the neighboring doves taking all the best branches to sit on! Lately the Kingfishers seems to be in a flap over everything! I can't shake this feeling though that someone up there is watching me. Ok Miley, Let's see you "twerk" your feathers like this! Perhaps we all need to pause and reflect on what we say and where we are going. (Photo by Donna). Got that strange feeling again, that someone is watching me? Hey, you lookin at me? I see everything says George! As I sit on the dock and gaze at the setting sun in the western sky I see bright billowy white cumulus clouds in shapes that the imagination turns into various animals and objects. Tonight I see a morphing “Florida Gator”. Last night the Editor said she saw a bird on wing flying into the sunset. Reminds me of the Joni Mitchel song Both Sides Now…”I’ve looked at clouds from both sides now”...the lyrics go, and ends with…”Its life’s illusions I recall, I really don’t know life at all”…isn’t that the truth. Suddenly I am startled back to reality by a familiar squawk. It is my Tricolored Heron friend coming in for an evening hunt in the outgoing tide. The Tricolored Heron is a medium sized Heron. It was formerly known as the Louisiana Heron. Similar species are the smaller Little Blue Heron and the larger Great Blue Heron, both of which lack the white belly of the Tricolored. Of all the Heron chicks I have seen, the Tricolored have the funniest look. Their head feathers look like they stuck their foot in an electric socket. It is a look very much in style now though it appears. During breeding season the beak gets an iridescent blue color and a white plume is very prominent on the head. 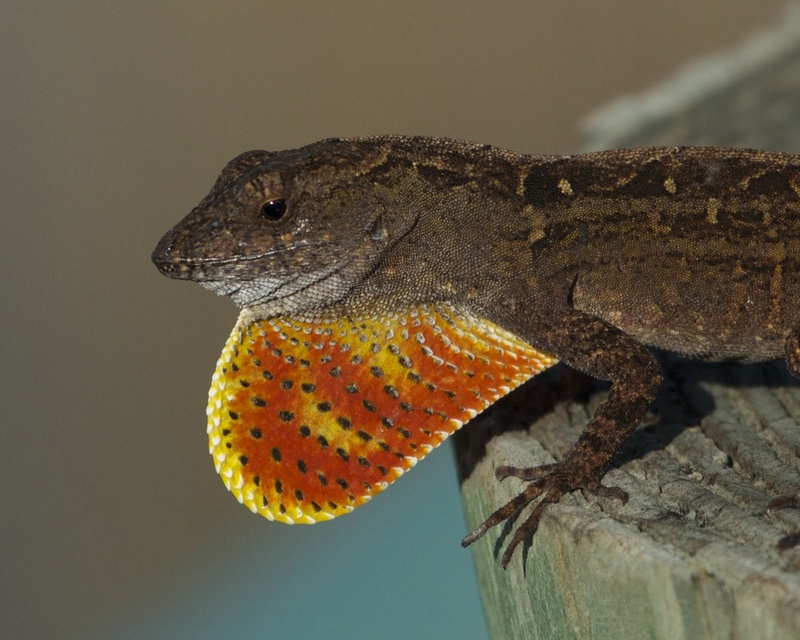 Found throughout the southeast and Gulf State coasts and as far north as Maine and Nova Scotia, it is a year round resident on the Broward. Its main diet is small fish and minnows and occasional crustaceans. Of the three Blue Heron species this one seems the most tolerant of my presence. When it is busy hunting in the shallows it will often walk within a foot or two and not get spooked. Unlike the other two Blue Herons I have also noticed that on the Kayak the Tricolored will often let me approach close by. When all other birds are gone on the Broward I can always find my Tricolored friend to be somewhere near by. Life's Illusions in the clouds. I see a Florida Gator in the middle. What do you see? 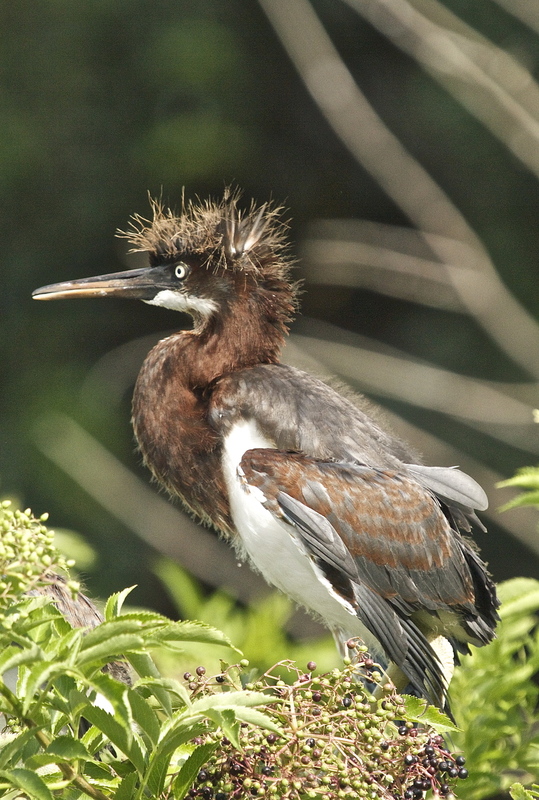 Tricolored Heron chick with spiked hairdo. The early bird gets the worm..but I want FISH! Here comes Mom, hope she has some fish sticks! 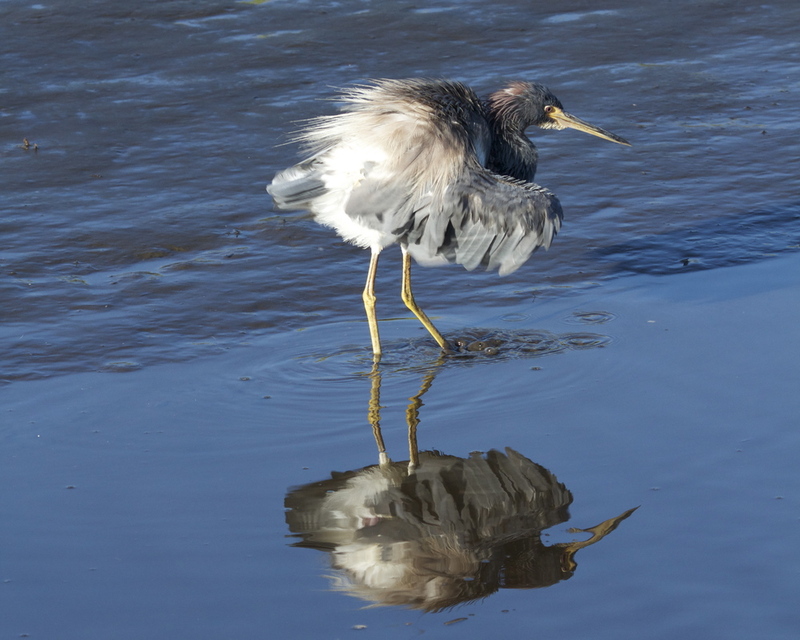 A juvenile Tricolored Heron, the brown neck will turn more blue grey when mature as will the wing feathers. A pair of young Tricolored Herons hanging out at the local Oyster Bar! 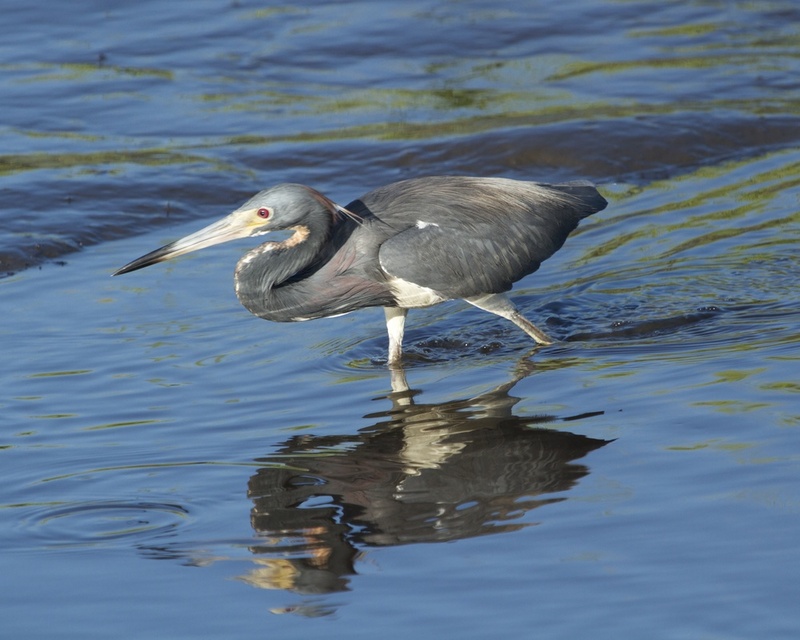 Adult Tricolored Heron hunts in the shallow tide stream. Note the neck is more blue grey. Mature Tricolored Heron on the boat launch piling, Often allows me to approach for photo ops. Tricolored Heron in breeding colors, bright blue beak and white head plume. Fresh shrimp breakfast on the Broward, mmm, mmm good. Gotta fly says the Tri. Me too says the dragon fly..
And now a word from our Sponsor. Do you think that new Miracle Lift surgery can fix my sagging neckline? Indeed it can. Call now. It is a beautiful September morning. The sky is blue and the tide is rising. It is a perfect day for a little Kayak journey. I slip into the channel and head up the Broward to the entrance to Turtle Creek. As I paddle across the river I meet Tommy the Crab Fisherman checking his traps. I ‘ve been hoping to meet him. We chat about the White Pelicans. But that will be a story for another day. I glide past a long pier under construction. George the Yellow Crowned Night Heron is there with his family checking things out. George’s young offspring keeps watch on me from one of the pilings. By next year its stripped brown and white feathering will change to look just like its parents. Old Man River, the Great Blue Heron, is sitting on the pier on the opposite bank. I have started to see him around a bit more lately but he is still as illusive as ever. Upriver on an old dead tree limb four Wood Storks stare down at me. I recall a cartoon with a buzzard in the desert on some old dead cactus limb looking down and saying “Patience Hell, I want to kill something!” The look on the Wood Stork reminds me of that scene. Then one by one the storks slowly saunter to the edge of a limb and jump. As I head up the river towards the entrance to Turtle Creek it is quiet and peaceful, for me anyway. 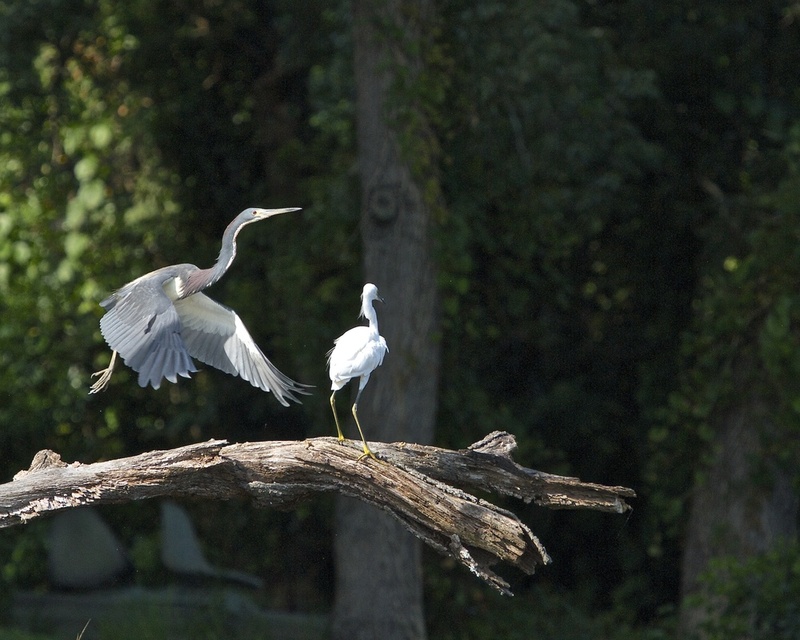 There on another limb is a very nervous Great Egret and a Little Blue Heron. 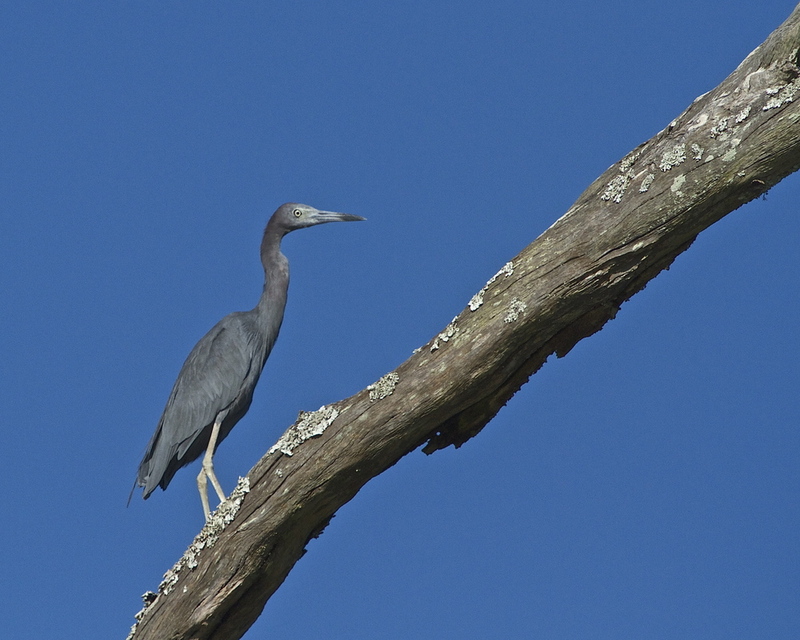 As I get closer, the Little Blue Heron begins to pace up and down the limb. Seems like there is just nowhere to go. Then a noisy male Kingfisher lands on a nearby limb, takes one look at me and says something not nice in Kingfisher, and takes off. This little bird has a real temper. A nearly all white young Little Blue Heron soars overhead and sits on a limb looking at me for a while. It must have hatched this year. Soon its feathers will start to turn to a pied blue and white coloring. Further up the creek a pair of Red Shouldered Hawks are out on a limb too but they seem to be enjoying the morning sun. September morning, heading up Turtle Creek on the Broward. A local crab fisherman Tommy checking his traps on the Broward. 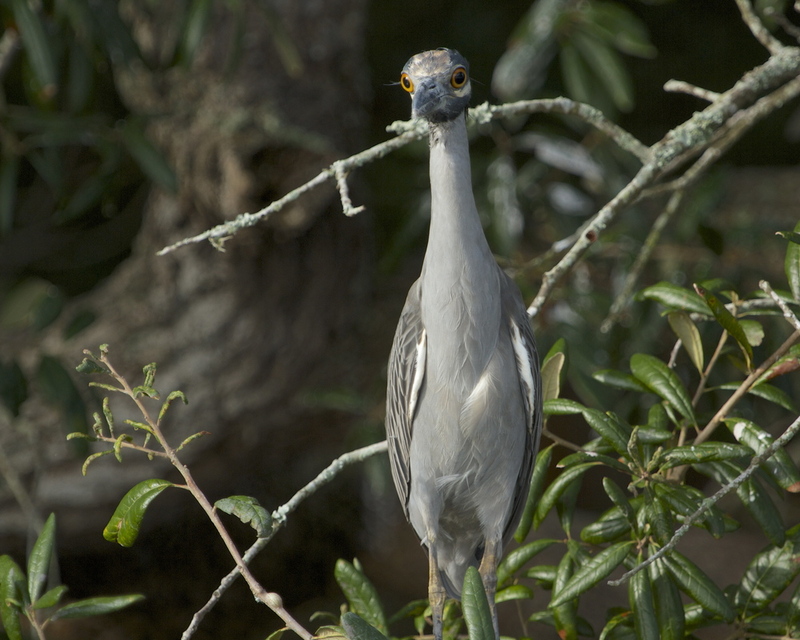 George Jr, a Yellow Crowned Night Heron in his juvenile brown and white feathering looks down on me. By next September George Jr will look more like his parents sitting below. Sure hope they fix this pier before it falls apart George seems to exclaim! 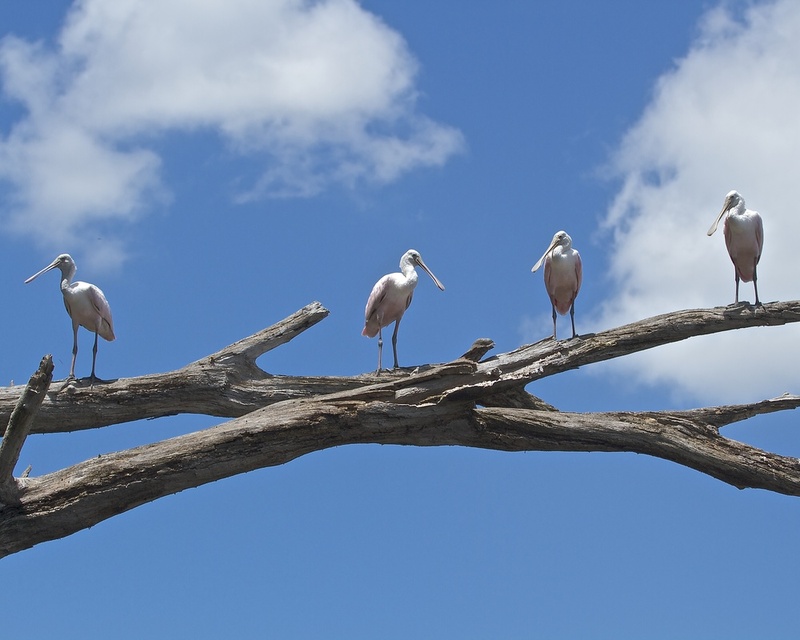 A quartet of Wood Storks stare down from the limbs of an old dead tree near neighbor Jim's. Just like the desert buzzard ..."Patience Hell, I want to kill something" is the look on the Wood Stork's face. A nervous Great Egret out on a limb looks down on me. A Little Blue Heron feels the weight of the world hanging over his head! Ever feel like you are out on a limb with no place to go? You are up all night. You pace up the limb. You pace down the limb. Can't swim, there are gators down there, too expensive to fly also! 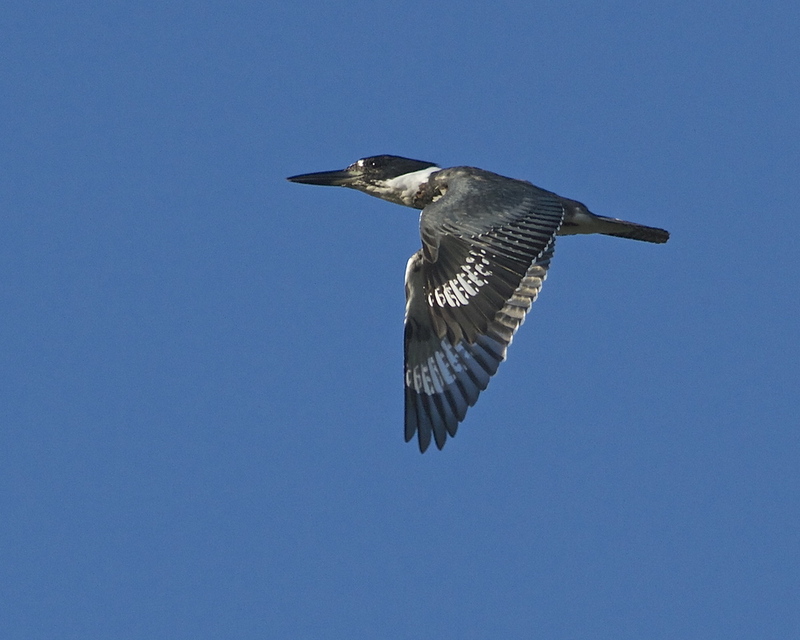 The Belted Kingfisher is ruffled by my presence and says some unkind words and leaves. The young Little Blue Heron just wants to look "Different" I suppose. Just like today's youth. You know, it is really not so bad up and out here on the limb. "Look at the view!" 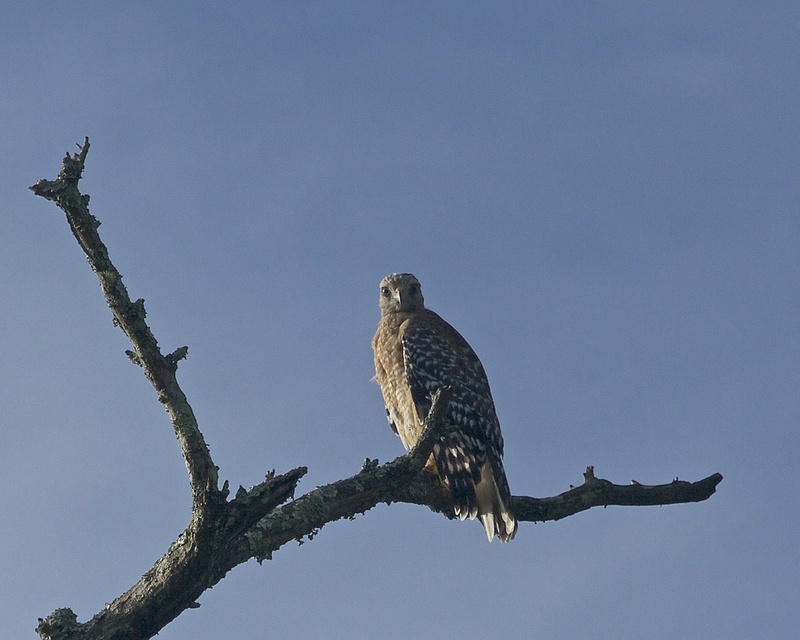 the Red Shouldered Hawk seems to say. It is a early but steamy morning on the river as I push my kayak into the still waters of the Broward. There is an incoming tide and soon I have the 8 inches of water I need to float. My paddle dips into the water and I lean forward a bit and begin to pull into the channel. Muscles that have not been used in a long time groan and come to life. The pull of the Kayak is felt beneath me as I ease into the deeper channel. Finally beyond the dock I am off to explore the far reaches of the river and creeks that until now were only available to me on a map. Remember the Broward bird "hideout" I found? I told them "I’ll be back". Wonder what I will see on this next voyage of my Kayak aptly named Reflections. I glide past long piers jutting into the river. The trees and marsh grass reflect like mirrors along the bank of the Broward. I spot a manatee feeding and tell tale fish swirls near the marsh reeds indicate the Red Drum (aka redfish, reds, Spottail or Channel Bass) are also feeding. 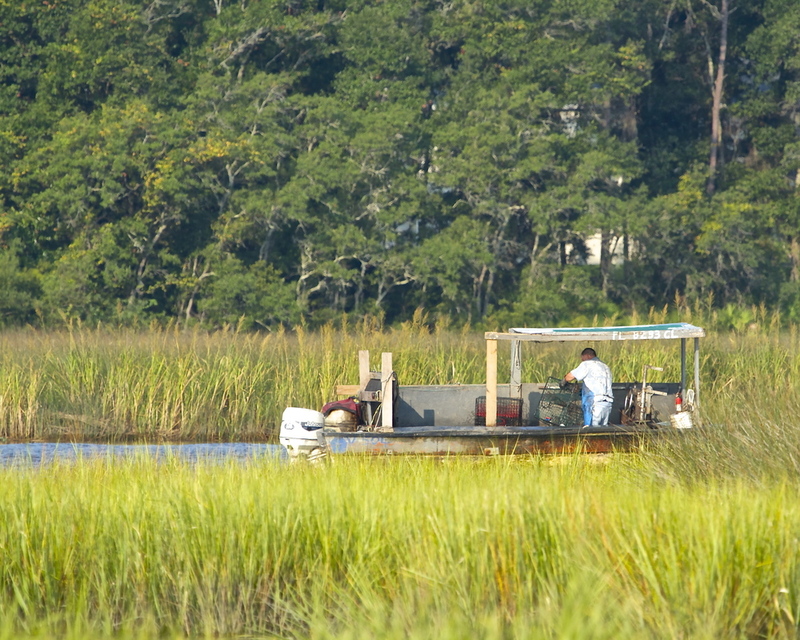 The tides bring nutrients and bait fish each day to the marsh. It is literally a river of living water beneath my Kayak. Hmm, going to have start carrying a fishing pole with me. I do love fresh redfish. As I turn into the tidal creek that runs by the school I seek out a small channel through the marsh grass to make an approach on the hideout from another direction. I see heads bobbing up and down in the tree and birds beginning to get nervous as I approach. The Egrets and Herons soon take flight. I stop and sit not wanting to disturb the other residents. I begin to whisper to the Spoonbills. They seem to calm down a little. The channel is very narrow and the marsh grass touches both sides of the Kayak. I raise the paddle to move forward a little. That was all it took. 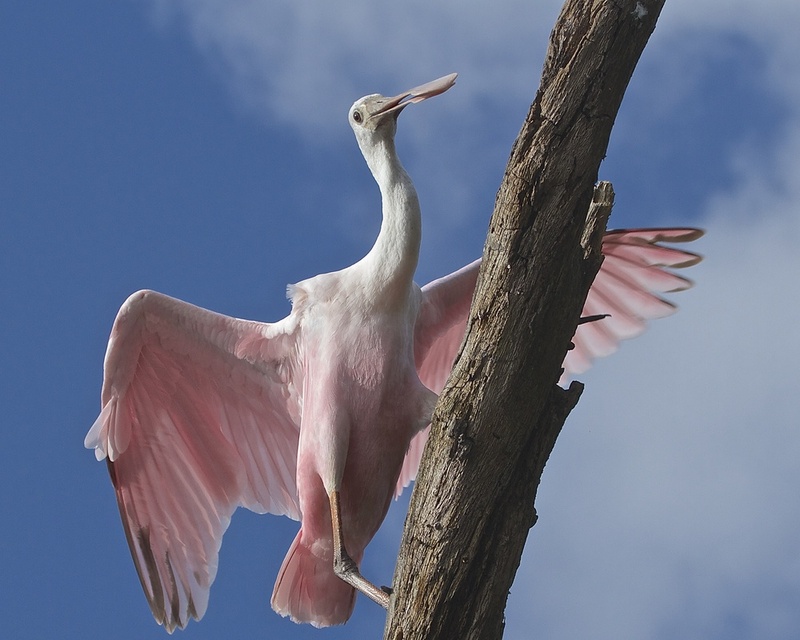 Two Roseate Spoonbills start dancing on the limbs, hop to the next tree and prepare to leave. All I can do is grab the camera and push the doohickey as they take flight. What a beautiful pink feathered liftoff though. The whole "hideout" bunch fly across the river to the opposite bank and land on a large old dead tree that hangs over the river. I have often seen Great Egrets sitting on those limbs. Today the tree is covered with birds. Undaunted I push forth across the channel and glide up to the tree. 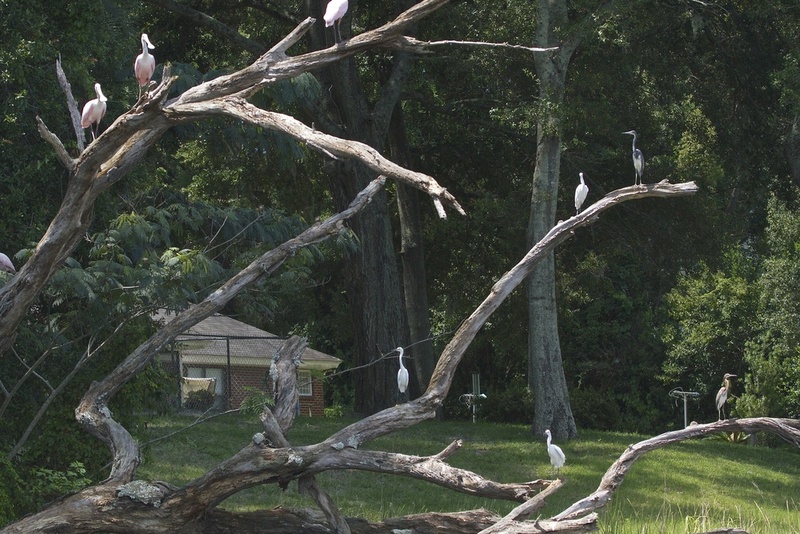 There are Snowy Egrets, Tri-colored Herons and Roseate Spoonbills sitting on the tree like Christmas ornaments. The Egrets and Herons again soon leave but the Spoonbills just sit and stare. So I just sit there and stare back at them. I apologize for disturbing them and head back to the dock. Although I love to photograph them I don’t want to intrude too often on their peace and quiet. I too enjoy living on this river of life and I don’t want to make them leave on my account. There are more streams upriver to explore another day. Trees and marsh grass reflect on the banks of the Broward as I nudge my kayak named Reflections up the channel to the secret Broward Bird Hangout. Oh Oh, He's Back! The Egret gets nervous. Juvenile Little Blue Heron lifts off. Finally the Roseate Spoonbills get nervous too! They hop over to the next tree. I nearly paddle underneath this young Tricolored Heron! The hideout gang fly across the river to an old tree. They look like Christmas ornaments. But the Roseatte Spoonbils stay and watch me! Look who's coming to dinner maybe! Mr Redfish! 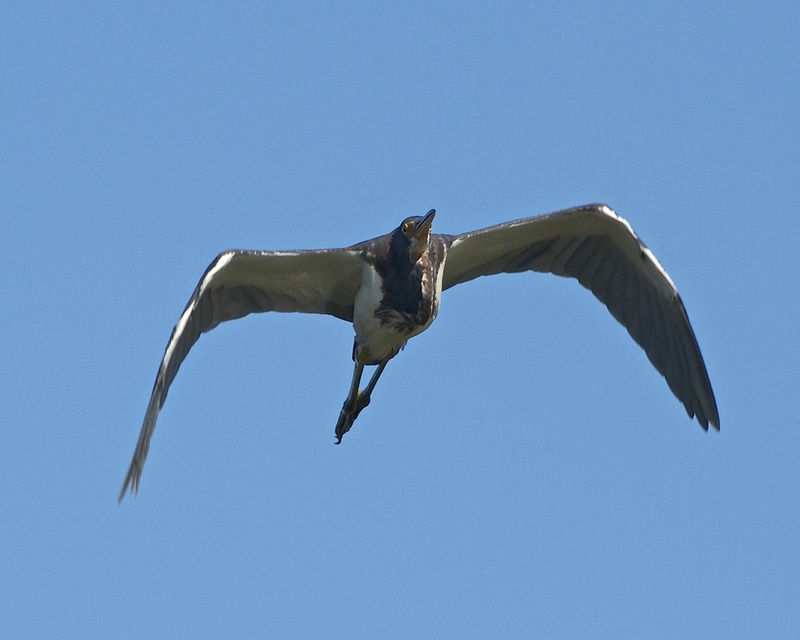 While heading back to the dock I get this fly by of a Black Crowned Night Heron. I leave you with this photo to the entrance to the Broward secret bird hideout, where the peaceful living waters flow. The Dog Days of August are behind us as September rolls in. The air conditioner is still working overtime though. Undaunted I still enjoy my morning and evening time on the dock each day. 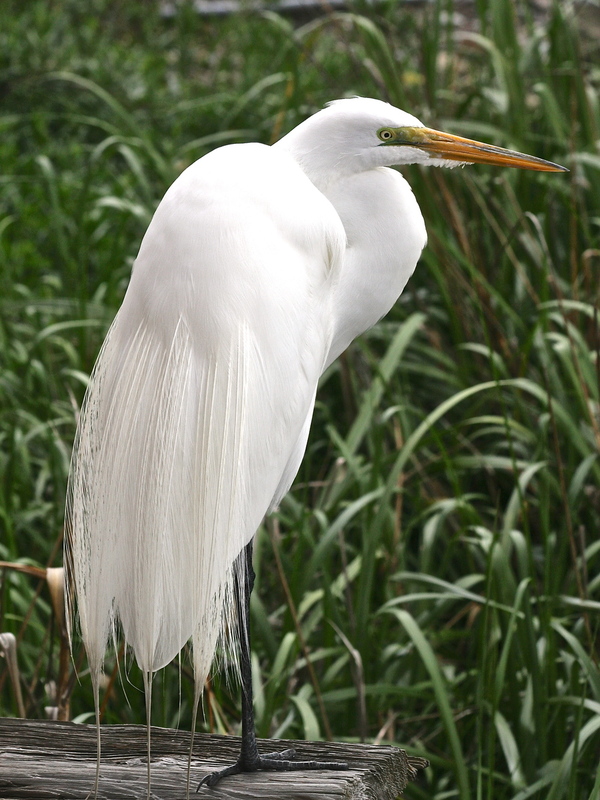 During this time of the summer one of the iconic birds found year round is the Great Egret. These graceful birds slowly glide by with huge outstretched wings. 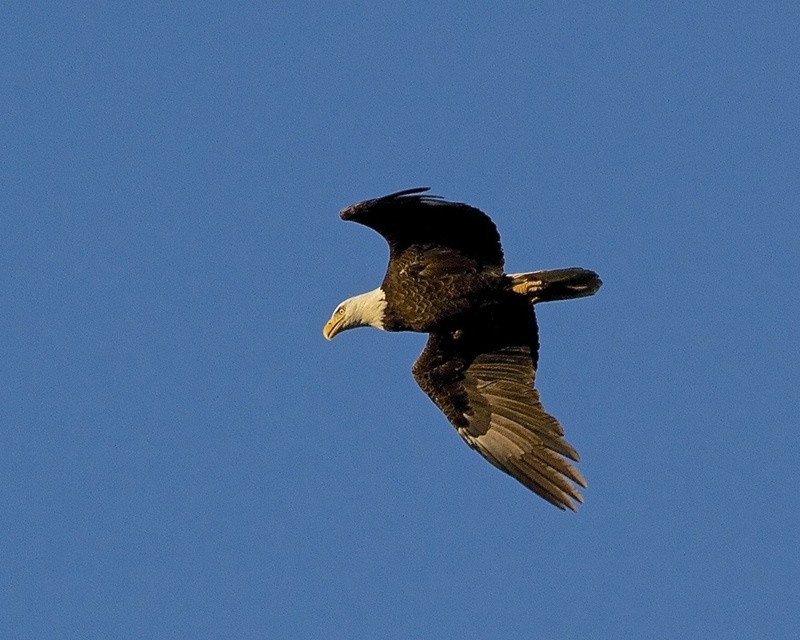 It still takes my breath away to see them soar overhead with those broad wings covered in bright white feathers. 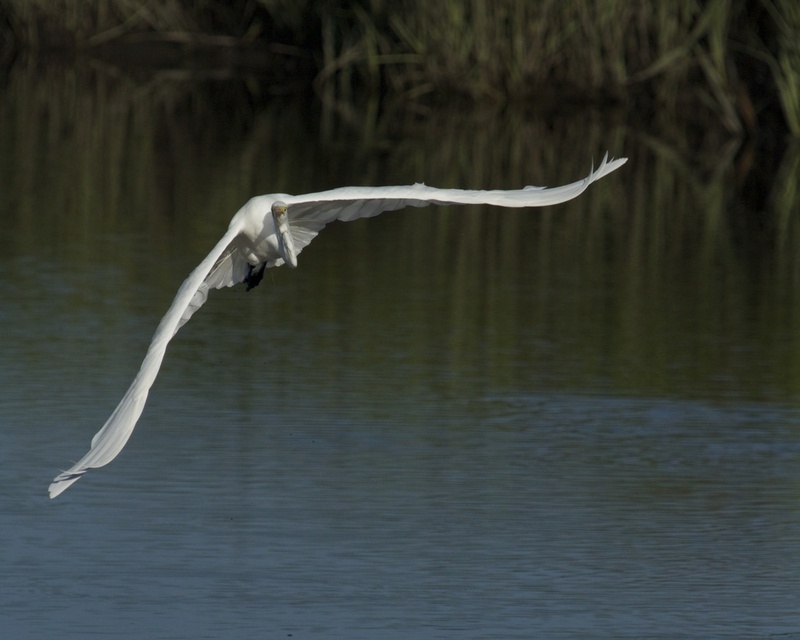 As I sit and watch a huge graceful white bird go upriver, it slowly turns towards me and starts to fly up the channel. I have my finger on the doohickey and capture a quick touchdown in the channel. As fast as it lands though, it raises its wings and lifts off again. The white wings reflect on the water as it slowly rounds the corner, banks to the left, and slowly heads towards me. The wings are so broad and wide I can barely keep the whole bird in the viewfinder. 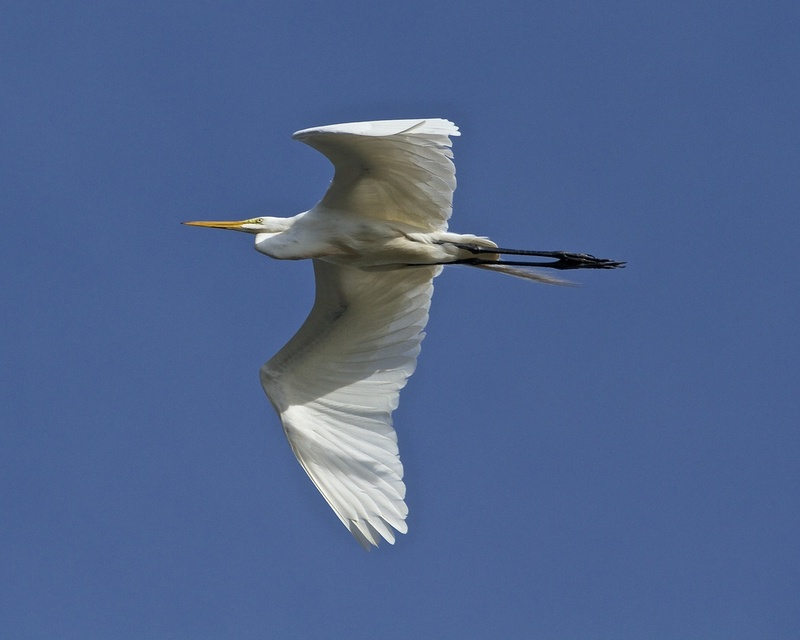 The Great Egret, the Bride of the Broward soars overhead. 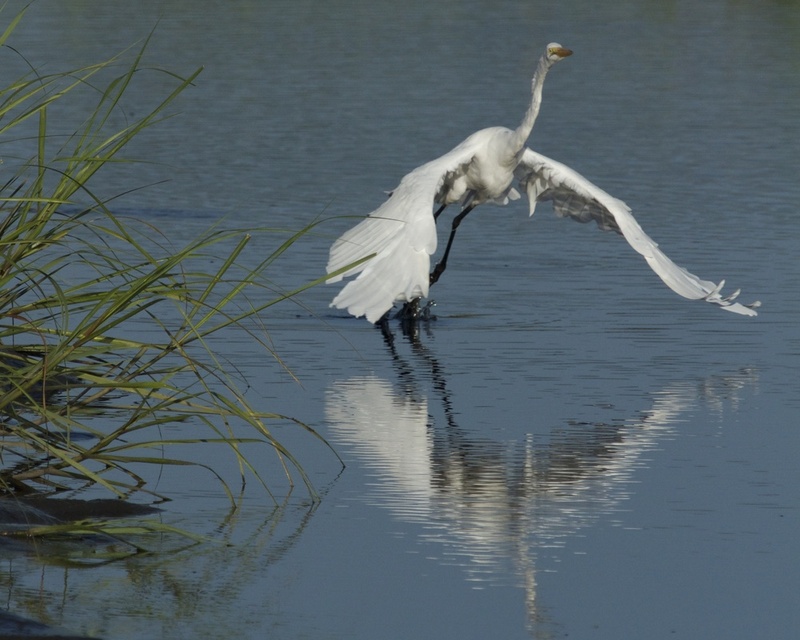 The Great Egret slowly and gracefully wings up the Broward. You can see them a mile away! The graceful wings flare for a touchdown on the Broward. Gotta adjust for the "white out". Graceful wings reflect in the water! A sweeping turn, its wing nearly kisses the water. Broad white wings arch towards me! Can't wait to meet the groom. A beautiful Bride. Photo by and with permission of my friend and photographer Donna Yost-Williams. And the Spirit and the bride say, Come. And let him that heareth say, Come. And let him that is athirst come. And whosoever will, let him take the water of life freely. Rev 22:17.